Are you ready to purchase your lease car? | How to know if you are ready. Use this checklist to see how prepared you are for your lease car purchase. We want to help you to answer the question 'Are you ready to purchase your lease car?'. Here at OSV, we've developed a handy checklist to see if you've done all of your research. Are you a 'wing it and lease it' kind of buyer or a 'super organised vehicle leasing extraordinaire'? 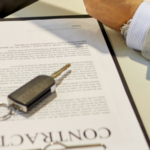 In this article we'll take you through all of the steps you should take prior to contacting the lease company, taking the plunge and purchasing your lease car.